Come join us every Wednesday at 12:00 p.m to see what we do in our community and all across the world. A club where service is always above self, and our members are welcoming and recruiting new and active leaders to help make a difference. 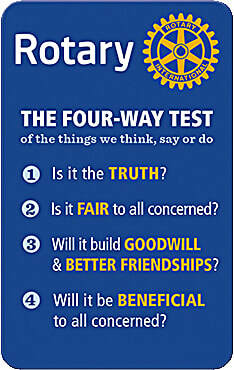 Rotary is one of the largest service clubs in the world and we would like to have you come check us out. State Road 59 South of Brazil. Our 2019 Health Kids Fun Run is coming up soon! Please explore this site by going to each page to find out more about our club, our purpose, the 4th of July Celebration, and the impact of Rotary International worldwide. Be sure to visit the pages under the "Our Club" tab to find out more about the Rotary Foundation, and the History of our club. Click the "Members" page to find out when you are scheduled to have a program for our upcoming meetings. Click the "Fund Request" tab if you are an organization and wish to submit a funding request from our club. ​Find out more about 4th of July Celebration and Rotary by watching the videos below. ​Like our FACEBOOK page for updates.